DC Circulator’s 18 new American-made buses have arrived! The new Circulator buses feature advanced engine and hybrid technology, wider door openings, greater visibility, a powered roof skylight and much more. The 18 40-foot hybrid vehicles, made in Minnesota, were ordered in 2014 to increase the system’s spare ratio and facilitate the 2015 launch of the National Mall route, where ridership is expected to exceed 880,000 in its first two years. Ride longer – better fuel economy due to 5% less weight compared to other hybrid and conventional buses. Breathe easier – significantly reduced particulate matter emissions lead to cleaner air and fewer public health concerns. Cruise smoother – advanced hybrid technology equals smoother, quicker acceleration and all electric power capabilities. Listen better – decreased noise pollution results in a quieter interior and exterior environment, making it easier to hear yourself and others. 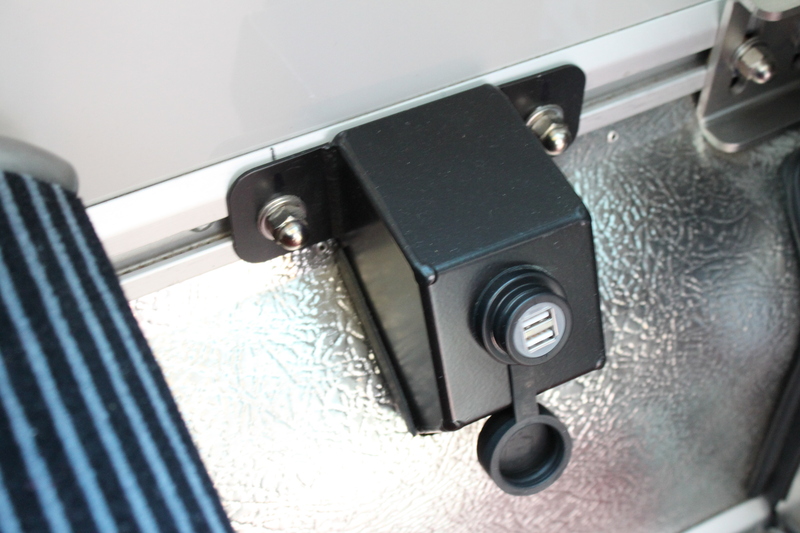 19 USB ports allow customers to charge personal electronic devices in their seats. Larger front destination signs with bright LED lighting improve visibility from afar. A wider door, low-to-floor entrance and a sloped 32” wheelchair ramp improve accessibility. Diesel-electric hybrid buses use electricity and diesel fuel to operate. Advanced computer technology regulates the efficient mix of diesel and electric power usage. Regenerative braking system stores energy, recharges the batteries and increases brake life. DC Circulator service began in July 2005 with 29 Van Hool 40-ft buses. In 2009, 14 Van Hool 30-ft buses were added to the fleet to implement route expansions. The fleet of Van Hools continued to grow to 49 total buses by 2014 to maintain five distinct routes across the District. The addition of 18 New Flyer buses will grow the system to 67 buses for six routes. There are plans to add more buses in the future to replace the fleet, enhance service and implement further components of the 10-year Transit Development Plan updates.